Obokun is a Local Government Area in Osun State, Nigeria. Its headquarters are in the town of Ibokun at7°47′00″N 4°43′00″E﻿ / ﻿7.78333°N 4.71667°E﻿ / 7.78333; 4.71667. It has an area of 527 km² and a population of 116,511 at the 2006 census. The postal code of the area is 233. Other towns include Imesi-Ile, Otan-Ile, Esa-Oke, Esa-Odo, Ilase, Iponda, Ikinyinwa, Idominasi and Ora. ^ "Post Offices- with map of LGA". NIPOST. Archived from the original on November 26, 2012. Retrieved 2009-10-20. 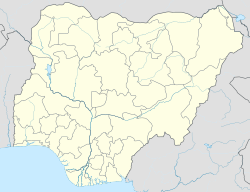 This Osun State, Nigeria location article is a stub. You can help Wikipedia by expanding it. This page was last edited on 24 August 2018, at 16:48 (UTC).